Get your sea legs ready. Come out of your shell at AlaMar. When Dungeness crab is at its peak-of-the-season freshest, it feels like a shame to eat it any way other than the simplest: steamed, cracked, and served naked but for a tub of drawn butter and a pile of lemon wedges. Fortunately, it doesn't have to be an either-or proposition. Now that the local Dungeness season is in full swing, you can look forward to expanding your crab-eating horizons beyond that classic preparation — and even beyond longtime favorites such as Southie's crab roll and China Village's ma po tofu with whole Dungeness crab. Miss Ollie's (901 Washington St.), chef Sarah Kirnon's Afro-Caribbean restaurant in Old Oakland, welcomed the start of the season with crab and grits: picked Dungeness crab meat served over Full Belly Farms grits — a $15 entrée that should make regular appearances on the restaurant's late-fall dinner menu. But one of the best things about crab season has to be Kirnon's fish blaff ($16.50), a recurring "Fish Fridays" lunch special that consists of cornmeal porridge topped with sweet crabmeat, sea egg (aka uni, or sea urchin innards), and other assorted fruits of the sea. When I reviewed Miss Ollie's, the blaff gave the restaurant's widely heralded fried chicken a run for its money for the distinction of being the most delicious dish to come out of Kirnon's kitchen. Mondays at Oakland's Camino (3917 Grand Ave.) are prix-fixe nights that offer diners a slightly more affordable taste of the restaurant's wood-fireplace-centric California cuisine. During Dungeness season, every Monday is a "Crabby Monday," during which diners will be served a three-course crab feast whose centerpiece is a half-crab grilled in the aforementioned fireplace. Last Monday's $40 prix-fixe menu also included a Dungeness crab bisque and, for dessert, rice pudding with roasted apples, jaggery syrup, and walnuts. It should come as no surprise that the best seafood-centric Peruvian restaurant in the East Bay would put together an interesting crab dish at this time of year. Pucquio (5337 College Ave.), the Rockridge cebiche (or Peruvian ceviche) specialist, is currently serving a great-looking duo of Dungeness crab ($20) as an appetizer. The first part of the duo is a persimmon-wrapped crab cebiche with ají amarillo crème fraîche and crispy seaweed; the other part of the dish is a Dungeness crab salpicon — something like a crab salad, chef Carlos Moreira explained. Cebiches tend to feature raw seafood, but in this case, the crab is cooked. Speaking of crab salad, Comal (2020 Shattuck Ave.), Berkeley's fanciest Mexican restaurant, has a salad composed of freshly picked Dungeness crab meat, avocado, and mandarins ($16) — a classic combination of crab and citrus fruit — on its current menu. According to chef Matt Gandin, the dish will be available every night for the foreseeable future. One of the most satisfying ways to enjoy a whole Dungeness crab is the Asian-Cajun way: boiled in a plastic bag with assorted Cajun spices and a ton of garlic and butter. You wind up with an addictively spicy, intensely garlicky, red slurry that serves as a delicious dipping sauce for the crab — as well as for the side of waffle-cut fries I highly recommend you order. 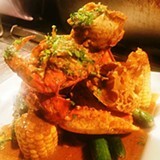 Here in the East Bay, two of the most popular Asian-Cajun eateries are Oakland's Rockin' Crawfish (211 Foothill Blvd.) and Alameda's Hang Ten Boiler (2306A Encinal Ave.), which are both carrying local Dungeness right now. When I called late last week, the going rate for a two-pound crab was $36 at Rockin' Crawfish and $32.99 at Hang Ten, though those prices will fluctuate with the market. The best thing about Hang Ten's version? 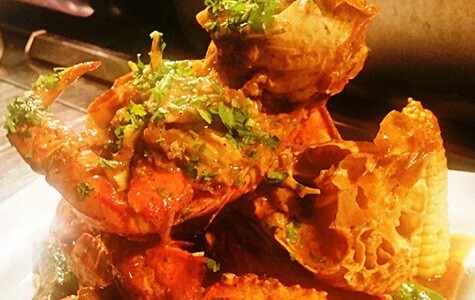 They fill the crab's head with a generous portion of rice — the perfect vehicle for soaking up all of the rich, briny crab "fat," which many crab connoisseurs swear is the very best part. Meanwhile, at AlaMar (100 Grand Ave., Oakland), chef Nelson German serves his own classed-up version of a seafood boil, wielding an array of house-made composite butters and fine-dining techniques to set his food apart from the rest. Dungeness season marks the return of one of the restaurant's most popular dishes: a whole chili crab served with a coconut sambal chili sauce, rosemary-infused Madras curry salt, and sides of Brentwood corn and baby zucchini. On Wednesday, November 26 from 5–10 p.m., AlaMar will host a pre-Thanksgiving crab feed, during which the chili crab will be sold for just $30 each (marked down from the usual price of $38). The regular menu will also be available; reservations are required.